My parents are remembered by my sisters and family during the season of Advent and the national commemoration of December 7–Pearl Harbor Day. Advent anticipates the coming of Light into the world while Pearl Harbor remembers the dark side of human behavior. These are bookends of the amazing lives of my parents, Edward Buell Feathers and Millicent Adelaide Jones Feathers. My parents were raised in traditional Southern families, Mom as a Baptist and Dad as a Methodist. They were both rather unsophisticated in their exposure to the world, but Pearl Harbor changed their lives forever. 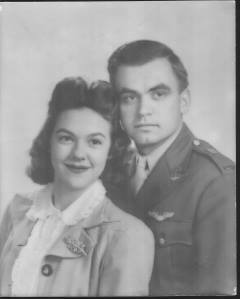 Dad joined the Army Air Corps and proposed to his sweetheart on the same day. Swept from their quiet towns into the cauldron of war, the trajectory of their lives changed dramatically. Together they brought my sisters, Beverly, Barbie, Kathy and me into this world and tossed us in the backseat of a station wagon. We crisscrossed the U.S. dozens of times over my father’s 22 year career in the Air Force. But one very special assignment took us to Honolulu, to Hickam Air Force Base. It was 1948 when our family was assigned to Oahu in the Hawaiian Islands. The remnants of war still scarred Wai Nomi Bay. Vivid childhood memories of a long stretch of beach with a lone pink hotel and green palms remains with me. Waikiki Beach held only one hotel, the Royal Hawaiian. The islands were a wonder to my parents, especially my mother. She learned hula from a Hawaiian teacher, we know only as Mama Bishop. 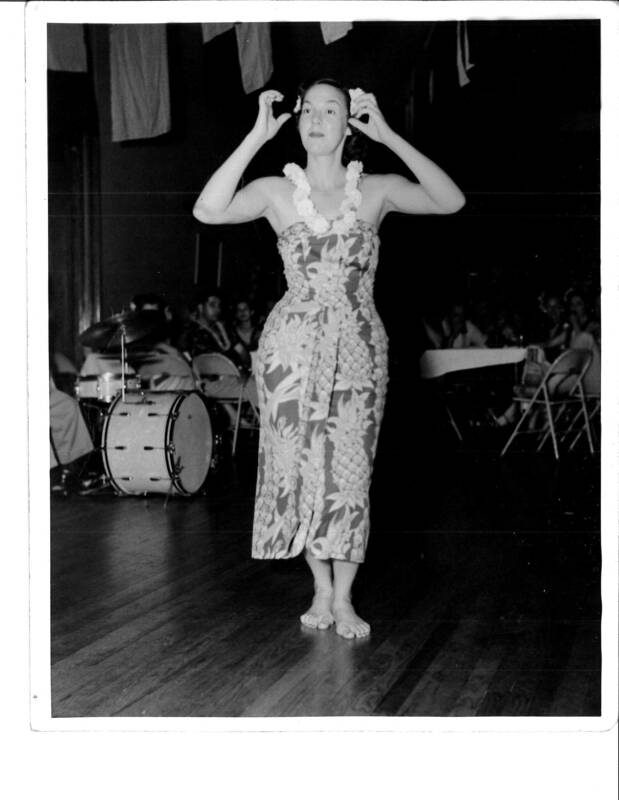 In 1949 Mom graduated from The Bishop School of Traditional Hula and would perform for years afterward. Below she is performing a traditional dance at Selfridge AFB in Detroit, a cold reality after the sunny, gentle island life she loved and yearned for ever after. Photos of Mom and Dad going out on the town in their silk shirts and dresses–splashed with native flowers in lavender, white, or ruby red–and always the blossom in Mom’s hair, show their happy young faces. They were very much in love. I was in awe of them at age 4. Yet this is just a slice of their lives. I prefer to remember when they were happy, young, in love with life, and dreaming of the future. In 2012 on Pearl Harbor Day Dad joined his Sweet Leilani on some distant shore transforming darkness into light. He was 95, still tripping the light fantastic. So today we symbolically throw an aromatic lei onto the green Gulf waters and hope it might return to those lovely beaches on a deep blue sea. How we miss our parents, Talking Bear and Sweet Leilani. So many tears for so many great memories. Thanks, Sis. This year I feel more joy and less grief. Its strange how we know our loved ones better and better as their lives come into their full perspective with time. Thank you Sus-I feel Mom & Dad all around us.